(L-ATV), which was recently selected by the U.S. Army and Marine Corps to replace aging up-armored HMMWVs. Today’s conflicts demand military vehicles with the protection, mobility and transportability to serve a full range of missions and unpredictable environments. The Oshkosh L-ATV combines proven automotive technologies, Mine Resistant Ambush Protected (MRAP)-level protection and extreme mobility in a light-weight, highly-transportable profile. The L-ATV offers armed forces around the globe next-generation capabilities that no other vehicle can match. In August 2015, after extensive U.S. Government testing and evaluation, the U.S. Army and Marine Corps selected the Oshkosh L-ATV as the winner of its Joint Light Tactical Vehicle (JLTV) program. Under the JLTV contract, Oshkosh will produce and deliver up to 17,000 JLTVs for the U.S. Army and Marine Corps. The JLTV program is scheduled to achieve full rate production within three years. 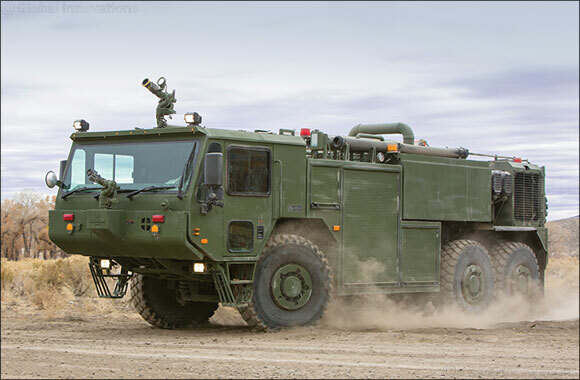 Roughly one-third lighter than the Oshkosh MRAP All-Terrain Vehicle (M-ATV), at the same protection level, the L-ATV weighs less than 6,350 kg at curb weight. The Oshkosh L-ATV has the latest in automotive technologies as well as the Oshkosh Core1080™ crew protection system, which is an occupant-centric, comprehensive systems engineering approach that considers every inch of the vehicle with respect to crew protection during blast events. The L-ATV is equipped with the TAK-4i™ intelligent independent suspension system; the next-generation of Oshkosh’s advanced TAK-4® independent suspension system. The TAK-4i allows the L-ATV to deliver superior ride quality at speeds 70 percent faster than today’s top-performing tactical wheeled vehicles. Additionally, the TAK-4i can be raised and lowered using interior operator controls to meet sea, air and land transportability requirements. The L-ATV can be air transported internally by a C-130, C-5, C-17 or externally by CH-47 and CH-53. Oshkosh has produced and sustained more than 150,000 tactical wheeled vehicles for the United States and its allies. Oshkosh serves armed forces around the globe by offering a full portfolio of heavy, medium, MRAP, airport rescue fire fighting (ARFF), and light vehicles. Oshkosh provides the full spectrum of vehicle life-cycle sustainment capabilities through its Global Integrated Product Support (GIPS) services. Oshkosh has been supporting militaries in the Middle East for nearly 30 years and has a well-established presence with program offices in the United Arab Emirates and Kingdom of Saudi Arabia. Countries throughout the region, including the United Arab Emirates, the Kingdom of Saudi Arabia, Egypt, Jordan, Iraq and Oman, rely on Oshkosh vehicles every day for tactical and logistical operations. Oshkosh Defense leadership will be available to discuss the company’s full portfolio, including L-ATV, in the U.S Pavilion at the Dubai Airshow in booth #1860.